It’s been a rough week at the Hart Senate Office Building in Washington, where the confirmation hearing for Supreme Court nominee Brett Kavanaugh has been unfolding like a bad episode of Law & Order. It might be tempting to skip over the details of these proceedings in favor of doing, well, just about anything else—trust me, I’m with you—but Kavanaugh’s potential (probable) confirmation from the Senate Judiciary Committee is looming, and that would likely mean that Roe v. Wade is in jeopardy. Among many other things. First, a quick primer, in case you don’t follow Supreme Court proceedings as closely as you follow shows on Netflix (guilty as charged!). After Supreme Court Justice Anthony Kennedy announced his retirement in June, President Trump had the opportunity to nominate a new justice. Before Kennedy’s departure, the justices were divided on abortion rights, but Roe v. Wade has remained in action since 1973, thanks to the court having a majority in agreement with upholding the landmark case. Not so any longer. Trump, of course, is jumping at the chance to appoint a judge who wants to deny women the right to choose what happens to their own bodies. Enter Kavanaugh, who, among other illustrious career highlights, served as staff secretary to President George W. Bush and was a key player in the effort to impeach President Bill Clinton. 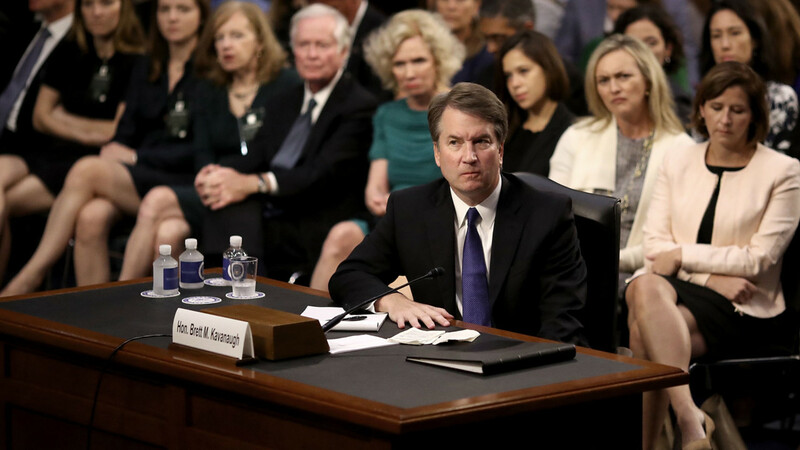 Before he can become the eighth associate Supreme Court justice, he has to appear for a confirmation hearing, where he is questioned and witnesses can make statements before the Senate Judiciary Committee. When that concludes—likely tomorrow—the committee votes whether to send the nomination to the full United States Senate. Once confirmed across the board, Kavanaugh can be appointed formally by Trump. Will this happen? It seems like—yes. Never say never, but even news today of Kavanaugh clearly perjuring himself seemed to be no deterrent to the Republican-controlled committee, which continues full steam ahead to the finish. Day One, Minute One of the hearings began with Democrats asking that the hearing be adjourned and rescheduled before it could begin, because 42 thousand pages of docs on Kavanaugh related to his work in the Bush administration had been released late the previous night. (And a happy Labor Day to you, too.) More than 70 people have been arrested protesting the hearing. Women’s rights, LGBTQ rights, voting rights and health care are all on the line. Though the reaction to Kavanaugh’s potential appointment is extreme, so too are his politics. In hearings this week, Kavanaugh sidestepped actually stating his stance on abortion outright. Instead, he made statements such as the right to abortion is “settled as a precedent of the Supreme Court.” But just because something is a precedent in law doesn’t mean it can’t be overturned. In confidential documents, Judge Kavanaugh wrote in 2003, “I am not sure that all legal scholars refer to Roe as the settled law of the land at the Supreme Court level since Court can always overrule its precedent, and three current Justices on the Court would do so.” Though he threw around the word “precedent” a lot, it’s clear this is nothing more than a word to him—a buzzword to help him sail through hearings. As usual, this is all a lot of “act now, deny later,” or, in this particular case, “be vague now, overturn later.” Though the New York Times’ Supreme Court reporter says it’s possible but not probable that two Trump-nominated justices would overrule Roe v. Wade, what’s to come—for women, for the LGBTQ community, for those who cannot afford health care without the Affordable Care Act—is murky at best. I could go on, but I’ll leave it there for now. If you didn’t catch it already this week, don’t miss the parts from the hearing about spying, conspiracy theories, recusing oneself from Trump-related cases, guns, and presidential power. I can’t say you’ll enjoy it, but I promise you won’t be sorry you’re a little more up-to-date on the circus currently unfolding in D.C.